FH is compatible with most Windows 64-bit operating systems on new computer/server installations of Windows. Computers and servers upgraded from 32-bit systems to 64-bit systems have demonstrated problems and are NOT recommended. * Depending on your workstation’s configuration, you may want to consider a faster processor and additional RAM, if you are purchasing a new computer. Note: For Novell, NT, and other networks we recommend an Uninterruptible Power Supply (UPS) be placed between workstations and the power source. What about FH Enterprise Hardware Requirements? What about FH Web Hardware Requirements? What about FH CAD Monitor Hardware Requirements? 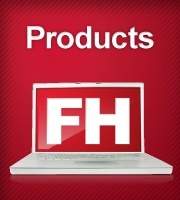 FIREHOUSE Software versions 6 and 7, FH Mobile, and FH CAD Monitor are compatible with most Windows 32 bit operating systems. FH is compatible with most Windows 64-bit operating systems on new computer/server installations of Windows. Computers and servers upgraded from 32-bit systems to 64-bit systems have demonstrated problems and are NOT recommended. Please review the chart below for the operating systems recommended at this time for use on desktop workstations, servers, and mobile computers.